One of my favorite holidays ... it's H a l l o w e e n !! Ever since I was a kid, it has always been fun to come up with an idea for a Halloween character and create the costume. 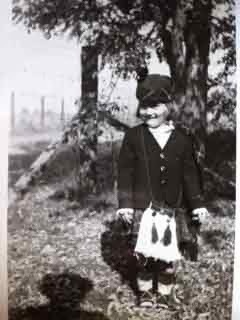 This was one of my earliest ... my grandmother made the "purse" from a mop and I was a little Scottish girl. Maybe THAT's where my love of Halloween came from!!! This year it was witches ... yup that's me with the green paint all over my face and hands. I carried around a basket with Toto in it as a hostage, looking for the ruby slippers. It was easy when we decided to be Harley riders. I didn't have to buy ANYTHING!!! So in the interest of a good time, this year I created a Day-of-the-Dead lifesize doll for my entryway. Unfortunately I had a LOT of trouble getting her head to stay on!! I can be creative, but when it comes to mechanical stuff ... not so much!! This is actually a screaming Mummy revamped. Everyone, including me, hated the screaming, so it was easy to rip her head off!!! Wouldn't you know though, when I put the skull on, I couldn't keep her mouth shut!!! 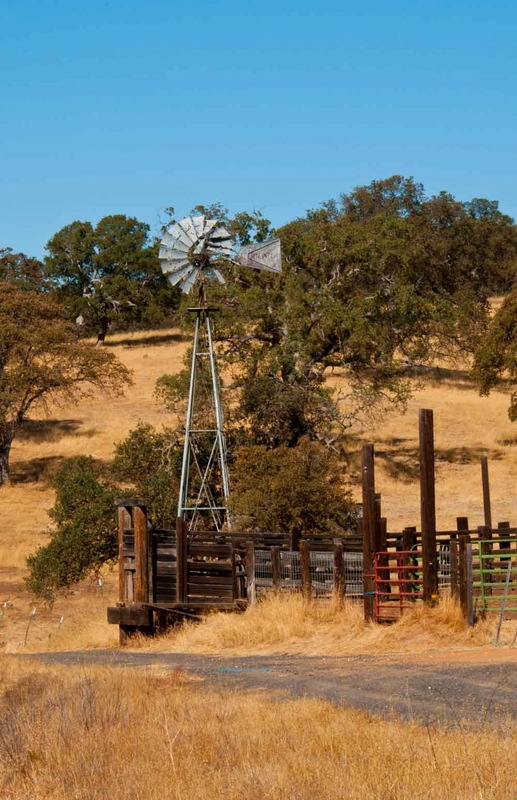 I had planned on getting to Raisin Hell Ranch again this year to help photograph their advertisements, but didn't make it. There's just not enough time in a day!! 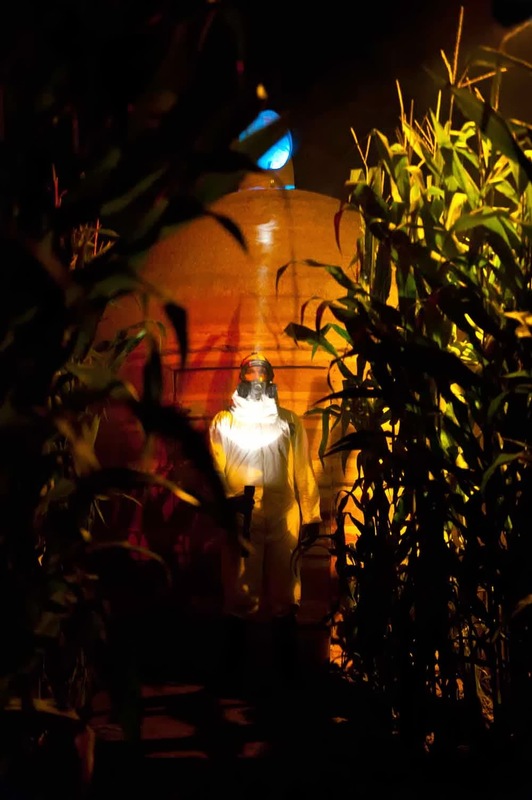 It was lots of fun to go through the two corn mazes and watch people getting scared. It's even MORE fun to be the scarer versus the scaree!!! The gas chamber was another hit. When you went in the door, it tripped a smoke machine. The guy here would not let you out until you banged on the door a couple of times. VERY scary!! And of course there were guys looking like this at every turn, jumping out of the dark to get you. Actually, this truck was rigged to shake and rattle with headlights ablaze, blinding you while he jumped out and scared you. It was all great fun ... I never laughed so much!!! The guy with the chain saw chasing you out the door at the end was the coup de gras!! This Halloween isn't even over and I'm already planning for next year!!! Happy Halloween!!!!! Another few miles under my belt! When I run, I wear a GPS watch that tracks my time, mileage and calories burned according to specific information you enter about age, weight, height, etc. I'm sure it's not totally accurate but close enough for me. I never really look at the "calories" entry ... and I never should have!! I accidentally brought up that section this morning to see that the 1-1/2 miles I ran only burned 84 calories. Almost makes it not worth it!! At LEAST it should be enough for another ice cream bar!!!! What a let down ... if I ever see that screen come up again, I'm closing my eyes!! To keep from gaining pounds over the holidays, one of the radio DJ's came up with a challenge to run a marathon between now and New Years. Not your usual marathon, but the total mileage. Run (or walk) one mile a day, with a few days off here and there, to a total of 26. What a great idea!!! For those that can't or don't want to actually run, maybe walk half a mile every day. Trust me, you will feel SO much better having done so. The added benefits are easier breathing, more energy and maybe even increase your immunity!! It's worth a try!!! Getting ready to head off to Costa Rica, I purchased a zebra-striped bag, easy to spot ... and packed it with everything I needed. Then I unpacked it ... then I packed it ... finally I unpacked it. Originally I was going to take a carry on only, but since that has been discouraged, the zebra soft-sided bag will be crushed. Course it took packing three different bags to see which one would go with me. The fewer the clothes and smaller the bag, the better. I'm not one to overpack!! Finally, I'm ready to hit the road. Unfortunately the bus leaves next week at 4:45 AM ... that's O-Dark-Thirty!! Ugh!! I'm not a morning person ... but hope the excitement will keep me awake long enough to get to our hotel in San Jose!! In the mean time, my friend Chris will be staying at my house taking care of the puppies and my horse. What a relief THAT is!!! Being mostly in the jungle, there's no internet service and phone towers are few and far between. I may be able to send Dan a few pictures that he can post on his site, but I expect you won't hear from me for awhile!! H A P P Y B I R T H D A Y T O Y O U !!!!!! HAPPY BIRTHDAY TO YOU!!!!! And many many many more!!! In case you didn't know, it's my friend Dan Chance's birthday ... hope you had a great one and ate LOTS of cake and ice cream!!!! If not, hey ... there's always tomorrow to catch up!!! So after that crazy obstruction call yesterday in the third world series game that ended with a St Louis Cardinals win (YAY!! ), I thought I might sleep in on this Sunday morning. No chance ... the dogs didn't care that I was up late (as they slept on the couch) and at their usual time of 5:30, they were up and at 'em!!! I didn't think I had that much going on, but by 3:30, I was pretty tired!! First up ... ride Showby again in my attempt to pump him up a little. He's such a sweetheart, I don't even need the halter. He will just stand there while I saddle him. That saddle seems to be getting heavier and heavier when it comes to hefting it two feet over my head to get it in place on his back. One of the things I will be looking for at the National Rodeo Finals in Las Vegas is an orthopedic blanket made specifically for older horses and maybe a ladder for me. He doesn't look too excited about this!! A few times around the corral and I headed out the concrete driveway to the road. Once in the field, he stepped right out ... until he heard the dogs barking. That made his head and ears perk up ... but we kept going, now at a slow trot. What he would really like to do is just take off like a bat outta h-e-q-q ... until he realizes he's too old for that kind of stuff. Surprisingly, he hasn't forgotten any of his training. I can still move his feet anywhere I want, he gives to the bridle really well and backs up like a pro. The turning is pretty hard on his arthritic shoulders, so I didn't go there. Thirty minutes later, I headed back to the corrals. No use making him too sore!! It's like us old folks running a mile ... the next day we can't walk!!! My friend Chris showed up with an empty cupcake can, which I promptly refilled and sent her on her way. More cutting and sewing of the quilt until I had all these squares, ready to lay out in a pattern. I couldn't quite figure out which way to place them. Should be pretty easy, right??? I mean really, I have a picture to go by!!! Finally the main design is down, ready to sew together. After that, MORE sewing of the borders before transport to a "real" quilter who will stitch the three layers together ... top, batting and backing ... with a pretty design. The final step will be adding the edging and my first quilt will be complete. Between cutting, pressing, starching and sewing the quilt blocks, I cooked a Country Pot Roast in the oven ... again with the Dr. Pepper, can of crushed tomatoes in puree, carrots, onions and celery. 2-1/2 hours later it was Delicious with a capital D!! On top of that, MORE cooking as I tried a test run of smoked turkey in my Bradley electric smoker. The only prep here was laying on the spices the night before and letting it sit in the fridge ... then after sitting out for about 30 minutes, I started up the smoker, put in two 4 pound breasts and set the timer. Four hours later it was turkey time!! I have to admit this was not my favorite. Even though I only had the smoke on for two hours, it was too much for my taste. It was however, VERY moist and tender and will make great turkey sandwiches!!! Now that I have enough food to last the week, it's time for the next World Series baseball game!! Think of me tomorrow morning as you are having your coffee ... it's running day again and I'll be out early. It's my excuse for eating those red velvet cupcakes with buttercream frosting ... it's okay, I'll run it off!!! Decisions ... Decisions ... !!!! I LOVE being retired!! I get to do whatever I want ... every single day of the week. The problem with that is making all the decisions about what to do!!! Sounds pretty silly, but working in the County Auditor Controllers office as Property Tax Manager (loved the job, hated the subject) I made snap decisions constantly, so it never was a problem. Now I spend hours on the computer checking things out before making ANY decisions, at least as far as travel goes. I'm looking at the alternatives for next summer. Go back to Oregon/Washington (which I absolutely LOVED) .... go to Venice on a photography tour with a World Class Photographer for a week (living in a convent ... how interesting would THAT be) .... or heading back east with friends and checking out the East Coast. Decisions ... decisions!! The thing to do is figure out how to accomplish all three!! Believe me, I'm working on that!!! In the meantime, I've been cutting up some of that material Patty and I purchased on the Alaska trip. I have to say, that unlike in the old days when materials were scarce and patterns reflected that ... today's pattern books call for much more material than is actually required for the quilt. Me thinks the books are written by the shops selling the material. With only two cut out, I'm sure I have enough leftovers for one more quilt!! One of my favorite things to do is shown here!! Cooper just turned 4 years old ... Happy Birthday Cooper!!! Finally he has slowed down a little ... not much, but a little ... and likes to play lap dog in the evenings. After throwing the ball continuously for 7 hours, it's a nice break for me too!! Miss Regal Jack Russell, Jessie Belle ... has taken to sitting up high on the back of my recliner. It's funny to see how their habits change after six months in the RV. She too has become a snuggler. In the evenings, there's one on each side along with a few snarls and low growls when one gets more Mom-love than the other. They are the best company ever, these two guys!!! Oh no!!! More cupcakes!!! I know, but I gave away all the last ones I made, and this red velvet cake box was calling my name from the kitchen cabinet. Besides, I bought a new hole-cutter at a great kitchen store in Florence Oregon that I needed to put to the test. Let me tell you, it worked perfectly!!! Not only that, but I got to eat all the holes I punched!!! Now filled with lovely cream frosting, these will be topped with a dab of cherry pie filling and placed in the freezer. When I just can't stand it any more, I'll pull one out ... hey, it's much better than eating a huge piece of cake!!! Today I'm taking my horse Showby outside the corral for a ride around the neighborhood. There is a 20 acre disced lot nearby ... perfect for working an older horse in need of exercise. I'll let you know how it goes. Hopefully that includes me staying on the upside of the saddle!! If you have ever been around horses in your life, you may know how hard it is to find ... and keep ... a good horseshoer. They are as rare as hen's teeth. For the last few years I haven't been riding much at all, partially because like people, horses really need shoes. The shoer I had did a terrible job ... something about horses feet should be "natural" ... like in the wild!! He had to be the ONLY hippy cowboy in the world. My horses aren't running across the sand and gravel of the wide open prairies, wearing their feet down. My horses don't even want to bother walking from one side of the corral to the other!! Finally I was able to contact Steve Brooks, Pacific Equine Hoof Care ... and he is amazing!!! It's like having someone you trust to work on your car's engine!! It has taken six months to get Showby's feet back in shape so he could even WEAR the steel shoes he's sporting here!! Now I can start riding him around, getting him in shape for the mountains. Baby's got new shoes!!!!! And so does Mom!!! I've worn all my old running shoes into the ground, and it was time for a new pair. I recommend Mizuno running shoes to everyone I know. They are like a pair of slippers ... at least for my feet!! Pricey for sure at $114, but I put on a new pair and ran a marathon without so much as a sore spot, let alone blisters. If you're not running 25 miles a week, they will last a very long time, making the price a little easier to swallow. LOVE these shoes!! By the way, Showby's new shoes cost the same as mine ... and his only last 8 weeks!!! Aaahhhgggg!!! On Wednesday I made the hours drive to Sonora to pick up our "packets" at the Chamber of Commerce Office for our Costa Rica trip. I rarely travel without my camera and that day was no exception. Before I took several photography classes, I would have driven up this road with no mind to the beautiful countryside. Now, some may say riding with me has turned into a nightmare!! Around every corner is another beautiful picture ... and many times I slammed on the brakes and pulled over! 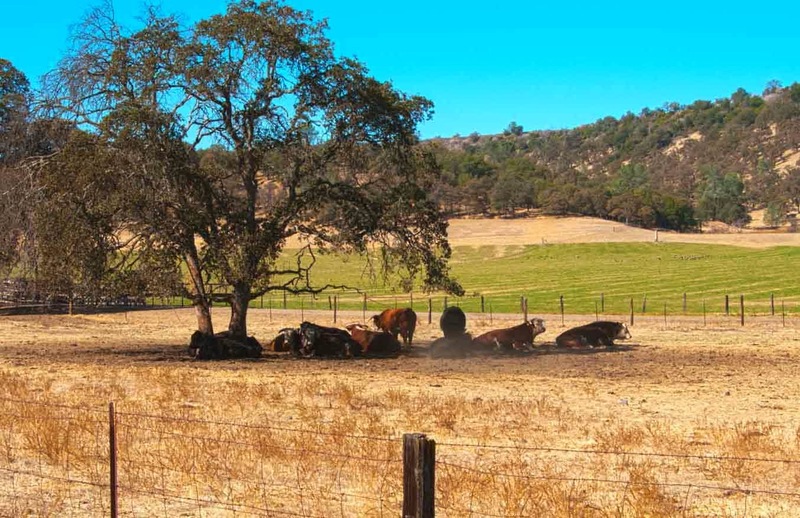 Once the season is over, the bulls are gathered up and kept separate from the cows. These big guys were just lounging under the tree, taking an afternoon nap, waiting for me to show up with my camera. 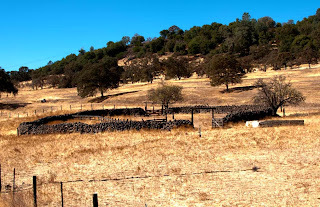 You may be familiar with the rock walls in the Sierra foothills ... with no money for wire and lots of rocky hillsides, the locals built fences and corrals with the rocks. 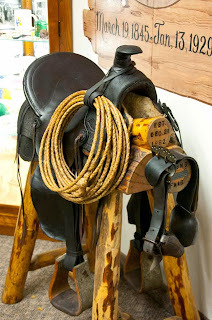 Many still stand today and some are used to hold cattle during branding. 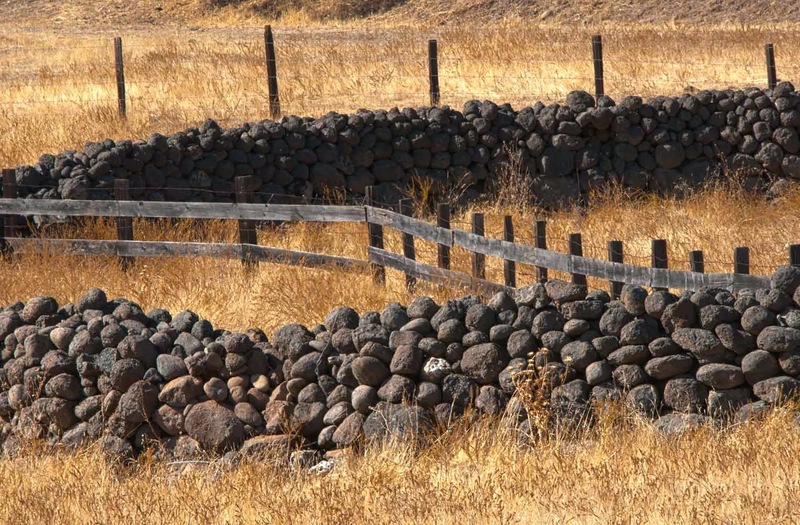 These corrals don't have any rebar or mortar ... they are simply rocks stacked upon rocks ... and still standing. This one has been here since I was a kid and was probably built many years before that!! And what would a trip through the foothills be without a windmill. You actually don't see too many of these any more since power lines can be constructed almost anywhere. 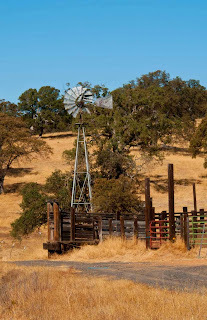 We had several windmills on our ranch .. the wind turns the fan blades connected to the rod, connected to the pump sitting on top of the well ... and voila!! water for the stock, no electricity required. This one is still working, filling a water trough behind the chute. Sure makes me nostalgic for the "old" days of riding horses and working cattle on a daily basis. The foothills are covered in gorgeous dried grass, looking like velvet across the hills. Even the camera can't do it justice!! Okay, time to put on those new expensive shoes for a quick 2 mile run!! See you when I get back!! What could be better than whipping up a batch of pumpkin butter for cool fall morning breakfasts?? Every year my friend Chris and I stock her pantry for the winter. It also makes great inexpensive gifts ... not so much for me, because I can take it or leave it ... but Chris' family LOVES the stuff!!! With all the utensils in the kitchen stacked on the counter and ready to go, Chris and I began the rather easy process of cooking up a batch. It's a simple recipe ... pumpkin, apple juice and lots of spices, including cinnamon, cloves and nutmeg. It's pretty much pumpkin pie for your toast!! The only hard part of this recipe is the stirring, which I gladly relinquish to Chris. You see, I've made this kind of jam for years ... and I know how badly you can get burned by exploding lava-hot pumpkin as it boils in the pot, inches away from your hand. A couple of ice cubes later and Chris' fingers were fine!!! Twenty minutes of cooking, thirty minutes of messing with sterilizing jars and lids, and we had lift-off!! The interesting thing about making any kind of product with pumpkin, is how the recipe changes over the years. My Mom and I made lots of jams, jellies and butters, never once dying from the products due to botulism or any other nasty organism. Nowadays however, people panic when you mention "canning" or "putting up" fruits and vegetables. Unless you actually put these jars in a canner and process them for an hour or so, you should probably keep them in the fridge or freezer and use soon after opening. Mine usually don't last that long, but I do keep them in the fridge. I have canned everything from applesauce to tomatoes to okra and green beans with no problems, but I guess there might always be the first time. "Making your own" requires your undivided attention to cleanliness!! Next up was scones ... cranberry orange ... a test recipe I made while the butter was cooking. Not bad ... not bad at all!! It does need a little tweeking but was definitely edible!! After eating an entire bowl of the artichoke-garlic dip test run, we decided different chips were called for. Don't be surprised if this one shows up at a rally soon. It was YUMMY!!! 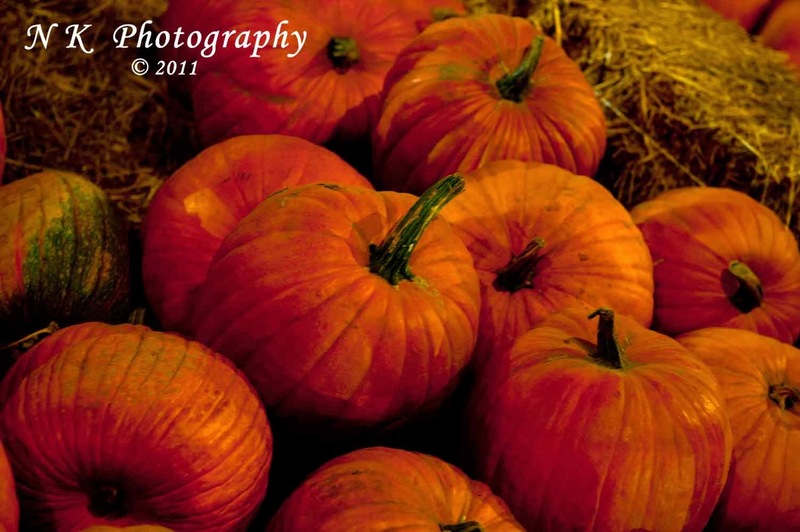 Done with cooking, it was off to the Pumpkin Patch for Chris' desk decorations. I was pleasantly surprised that the prices ran from $1.50 to $7.00 each. Now that's a price today's families can live with. This was the farms first year at pumpkin patching and with a hay ride, petting zoo (if 3 animals make a zoo), tricycle races and a corn maze, it was a hit. Thanks to the Facebook advertising they received, the place was packed with families. Kids were racing around the hay-bale race track on tricycles and scrambling up on the hay wagon for a trip through the fields. Bales of straw stacked in a giant pyramid made for lots of climbing fun. Since Chris hadn't actually seen how pumpkins grow, we took a short walk to the fields, where her photography-self came out as she ran from pumpkin to pumpkin taking pictures!! They are set up in an old dairy barn, amazingly clean and neat with pumpkins stacked everywhere. "Dad" of the pumpkin patch loves flowers, and it shows. They are planted in neat rock planters all around the property. The latest kind of pumpkin is called the Cinderella. Wide and flat with deep grooves, they immediately catch your eye. We found this one hiding in a back corner!! Who could resist this beauty??? Back at my ranch and loaded up with pumpkin butter, scones, pumpkin cupcakes, cinnamon rolls and recipes, Chris headed home. I was VERY thankful to get rid of all those horrible calories ... I mean delicious goodies ... so they won't end up on my plate. I think I overdid the taste testing. My reward for that will be running a couple miles every day!! It's been awhile since I hit the streets, so I'm kind of stiff and sore!! But if it means I can have another cinnamon roll, I'll suffer the pain!!! Today I'm off to Sonora to pick up our packets for Costa Rica. Patty Chance and I will be spending a couple weeks relaxing in the sun and playing "find the bird (or monkey) 100' up in the tree". It should be an interesting trip ... we are the ONLY two who signed up for the extra 3 day boat ride down the river. Do you think they know something we don't??? The Battle of the Diet was lost last night, but I'm hoping I can still win the war!! I'm in the recipe testing phase of RV life ... and it's G O O D!!!! After going through all those magazines I received while gone, I found many new recipes to try. The pumpkin cupcakes were one ... now I'm on to the cinnamon rolls!! With no one here to taste test everything, I'm stuck with that unpleasant task. It was a good fight, but I lost badly as I scarfed down the second one without a backward glance!! This is one of the easiest recipes I've tried for these ooey gooey delights, so if you're interested, let me know and I'll email it to you. First off the hard part... the dough. Buy it in the frozen bread section and thaw it out. How easy is that??? One 1-lb loaf makes two 9" cake pans full, about 9 cinnamon rolls in each pan. I left the dough sitting on the counter under plastic wrap to thaw. Instead of rolling it out on a pastry sheet, I use old (clean of course) pillow cases. Roll it to a rectangle 18" x 6". Now spread with softened butter and add the brown sugar and nut mixture. Roll up tightly, sealing the long edge. Cut into 1" pieces with a sharp knife, placing them in the buttered cake pans. Let rise for 1-1/2 hours. This was the hard part, but I chopped and hacked a couple more rose bushes while I waited. That's it ... well almost anyway. There is a secret ingredient poured on just before baking ... something that might make you say UGH!! Just persevere and you will be rewarded with extra special goodness. A little powdered sugar/milk/vanilla frosting and you've got the yummiest cinnamon rolls ever!! Now you can see why I downed two like a shot!! I'm hoping to make stacks of these yummy rolls for the Indio Rally so everyone can try them. At least when I fall off the wagon, I won't be alone!!! Still no word from the plumber ... I'll be calling them early Monday morning. In the meantime, my friend Chris wants to make Pumpkin Butter for her family. While she's here, I'm going to make cranberry scones and use her as the taste tester ... saving me a few hundred calories!!! The Test of My Self Control!! So maybe it wasn't such a good idea to make those pumpkin spice cupcakes. At first I just heard a quiet scratching noise coming from the kitchen. The dogs could hear it ... they kept looking that direction. The scratching turned into a whimper around noon and the dogs started barking. By 2:30, they were screaming my name incessantly!!! Four trips to the fridge resulted in two bottles of water and half an apple but my self control was fading FAST!!! Just to show how desperate I was, I ate two more calcium chews!!! At least I'll have strong bones to go with the pounds I will gain back!!! In the hopes of quieting the voices, I headed outside to play treasure hunt in my back yard, trying to locate the sprinklers that needed replacement. Steak knife in hand, I stabbed at the grass getting all my aggressions out until I hit a hard spot ... the sprinkler head. I dug up six!! By the way, steak knives work really well for trimming away the grass around the edges. Exercise worked for a couple of hours, but I knew I was still in trouble ... Nancy, we're here ... and we're sooo good!! In a last ditch effort, I grabbed my clippers and gloves, heading for the overgrown rose bushes. Did I mention these were supposed to be carpet roses?? You know, the kind that are only 18" high?? Trimming those would have been a breeze compared to these huge bushes, even larger since they were over-watered during my absence. This is what I trimmed off ONE bush!! Sorry Patty, they really needed a haircut!! Three bushes later, I was feeling much better!! The rest of the small one shown below is in the wheelbarrow above!!! If I can't have carpet roses, I will settle for these, but the much smaller version on the right. Only 6 bushes to go!!! Now I'm stuck with disposing of huge piles of thorny, sticky branches ... but the roses look MUCH nicer. Not only that, but my diet trick worked, at least temporarily. My fingers were now so full of thorns and blisters, that holding a cupcake wouldn't be pain-free, and they remained in the fridge. One more day of torturous cupcake voices and I will get a reprieve ... my friends are coming over with their two high school girls who will polish off these morsels of deliciousness in a flash, without the related weight gain!! No word from the plumber, but if he comes by today, I'll try to ply him with pumpkin spice. Maybe he'll fix my now leaky kitchen faucet for free ... you never know!!!! Unfortunately for me, the test of my self control continues!!! The Good, The Bad and The Ugly!!! Plumber in attic: Wow, you have a well built house!! Nancy: Thank you!! That's great to know!! Plumber in attic: Ohhhh, they didn't use the right type of flue material. Plumber in attic: That will have to be replaced, as well as the supply lines that aren't rated for this large a system (can you say flood in the attic?). They also didn't put in a cleanout to service the unit. If you don't fix that too, you will lose the entire thing in 4-5 years, about a $5,000 replacement. Oh, and there are TWO heating units up here. Nancy: Oh car-rumba!! Well not exactly, but that's the nice way to put it. 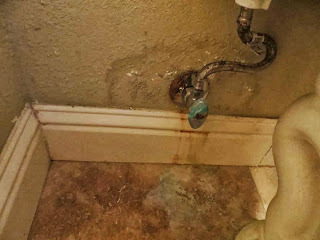 The original reason for the call was this nice leak in the second bathroom. Of course we know the explanation for this ... it's those lovely tablets that I use in the tank to keep from scrubbing endlessly on the bowl. The tank portion of this I can replace myself ... the valve and water supply will be done by the plumber. I plan on watching VERY closely to see if I can do this for the other two bathrooms should the need arise. He did suggest that I use the latest and greatest gizmo that sticks a lump of blue goo on the side of the bowl. His wife says it works good with no deterioration inside the tank. I "could" use the tablets, but be sure and remove them if I'm not here for weeks at a time and plan on a toilet overhaul every couple of years. The third problem was the reverse osmosis tank under my kitchen sink. He said it needed to be replaced, as rusty water came streaming out of the bottom when he flipped it over. Another $100. The fourth problem, the bathroom shower faucet cartridge needs replacing. Geez, nothing lasts like it used to!! My house is only 10 years old for goodness sake!!! I guess the problem I have here is how confident I am that this guy is not playing me, but what's a girl to do?? The company has been in business for many years, so I suppose they are being honest. I hate being so distrustful, but once burned, twice shy. I also plan on spending a lot of time on the internet looking up tankless hot water heaters. To appease my stress from all this bad news, I dug out some of my cookbooks looking for high-sugar recipes. There's nothing like two dozen pumpkin spice cupcakes with cream cheese frosting to make a body feel better about bad news. I know these aren't good for my diet, but I have a secret way to NOT overindulge. Most go in Christmas cans in the freezer, unfrosted. Since it's so time consuming to frost them, I usually eat them plain. If I'm REALLY craving something decadent, I frost only a few at a time. That way I can't get in trouble by eating an entire dozen!!! I should have the estimate on the Ugly in a couple days ... I'll keep you posted!! It's been a quiet week catching up on things at Buzzards Roost. A couple of days I've been just plain lazy ... a couch potatoe ... reading through most of my stack of 35 magazines received while I was gone. The puppies love it because they can roam around the yard freely, not tethered by a short 8 foot leash and harness!! Unfortunately it's not enough to keep Cooper from wanting to play "throw the ball"!!! At least I found a new toy that is pretty much indestructible and still squeaks!! He has that crazed look in his eyes!!! My peaceful days of crocheting, knitting and reading didn't last long however. Brown spots in the lawn required sprinkler repairs, horse sticking head through fence and breaking section required repair, plus lots of clean up. Just when I think I'm about caught up, the toilets fall apart. I'm pretty sure it's because I use those clorox tabs in the tanks. I know, they aren't good for the parts and pieces, but they make cleaning SO much easier. I already had to replace the guts in one toilet, now we're on number two! In this case, I think the tabs corroded the plastic nut on the handle, which broke. Easy fix ... except since I wasn't wearing the Hickory Flavor perfume, I got the wrong salesman at Home Depot, who gave me the wrong part. Once replaced, I thought I was done. WRONG!!! Look what I found!!! This I'm afraid, requires a plumber ... at least one much more knowledgeable than myself. It looks like the pipe was leaking in the wall. So here's my question to all the more experienced RV travelers out there ... do you turn the water off at each unit? Do you leave water in the tank? If not, do the rubber seals dry up and leak? This was my first experience leaving the house for more than a month, and so far I've had to fix three toilets. There MUST be a better way!!! The new App shows you how much of your diet is carbs, fat and protein. I was at 50% carbs (my favorite!!!) ... now trying to swap out veges instead. The Rest of The Story .... MR. Earp !! As I mentioned previously, John Alkire, CEO of the Big Fresno Fair, is passionate about 4-H, FFA and agriculture! He wants everyone to not only enjoy the fair, but learn about the history of fairs and agriculture in general. 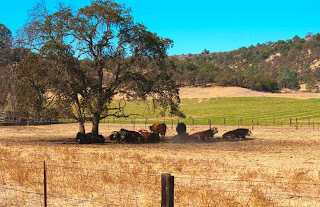 Did you know Fresno County is the biggest food producing County in the World??? In his continuing quest to promote all of the above, he has started to collect historical items relevant to the Fair and it's history. Some of it was pretty amazing and everything had a "story" ... not only about the item, but how it was discovered. This room is chock full of fair history, from an exact replica of the half mile wooden race car track that burned down, to First Place ribbons from 1913. He is so enthusiastic about this project that people have contacted him from all over, offering their prize possessions for his museum. By next year he hopes to have a separate building large enough to house all the items. This is a must-see for everyone!! 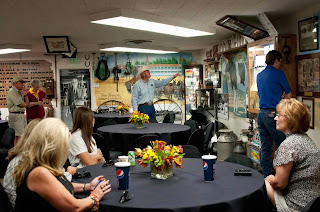 From the first ever cotton candy machine to the first popcorn machine (with pictures documenting their use at the fair) to Horse Racing saddles ridden by legends, this little room has it all. They even have a slot machine. One of the previous managers had it placed outside his door and insisted anyone wanting to speak with him, had to drop in a few coins. Course he had it rigged to NOT pay off so he could collect the money at the end of the year for use at the fair. Pretty smart guy!!! John included the bad history right along with the good. 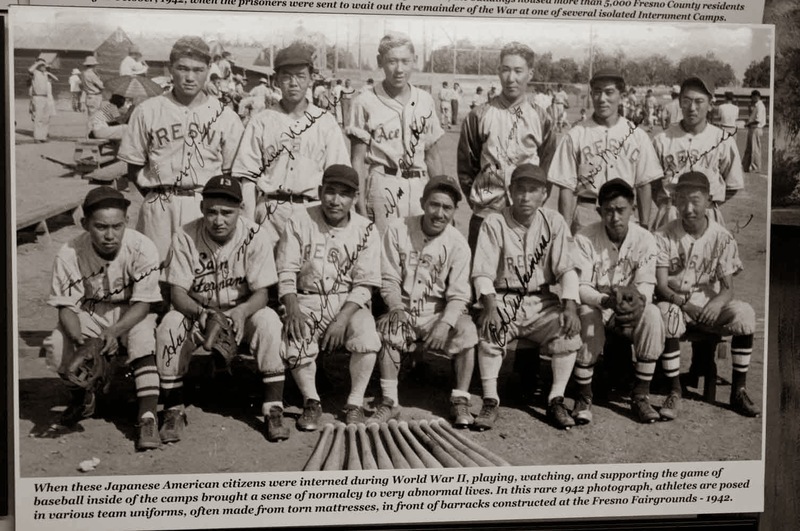 Fresno Fairgrounds became an internment camp for the Japanese during World War II. These energetic people tore up their mattress pads to make uniforms for their baseball team in order to keep busy. 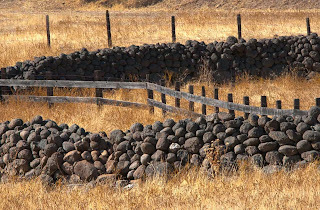 Many were farmers who might have lost their land without the help of their neighbors who kept the crops growing until their return. Here's one for my train friends ... now THIS would have been a great fair attraction!! 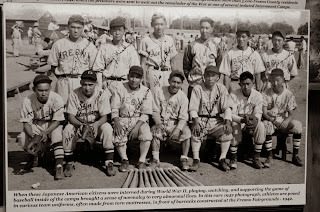 In 1919 the opening ceremonies began with a BANG!! 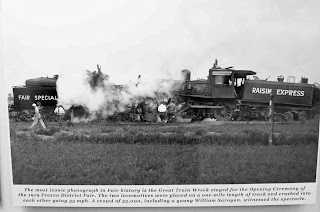 The Great Train Crash had two engines set on one mile of track. They raced towards each other at 35 mph until they crashed. What a spectacle that must have been!! That's MR. Wyatt Earp!!!! Wyatt was known to LOVE horse racing. He apparently had several of the fastest horses ever and made lots of money, along with his brothels, hotels and saloons. 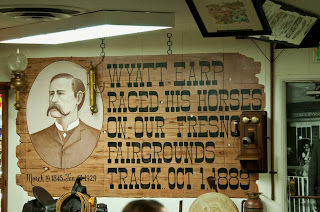 Records indicate that he raced his horses at the Fresno Fair in 1889. Who knew??? Hanging next to his picture is a coat rack from one of his hotels. Wyatt might have hung his hat on that rack ... and maybe his coat ... and maybe ... well I won't go there!! In one of the sheds out back, John found this really old saddle. Upon taking it to a saddle repair shop, he discovered a date on the wooden tree of 1890 (I think ... note to self, write this stuff down!!!). 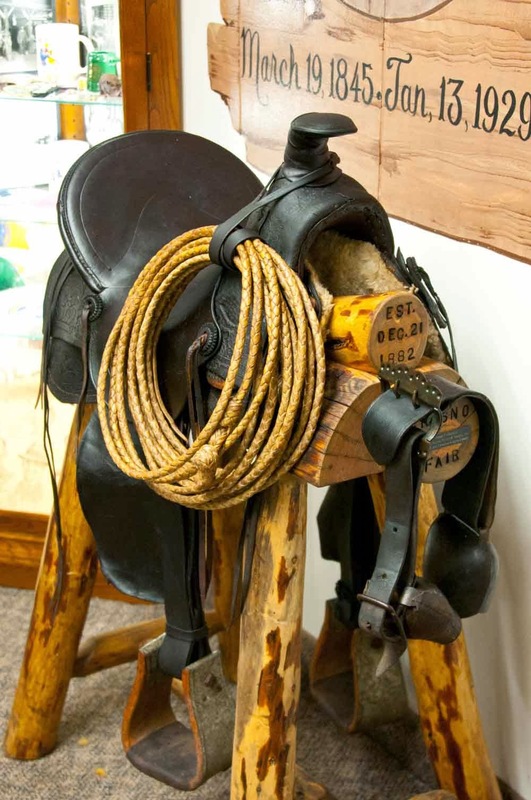 It's fun to think that Wyatt Earp might have ridden this saddle! A long shot, but you never know!! 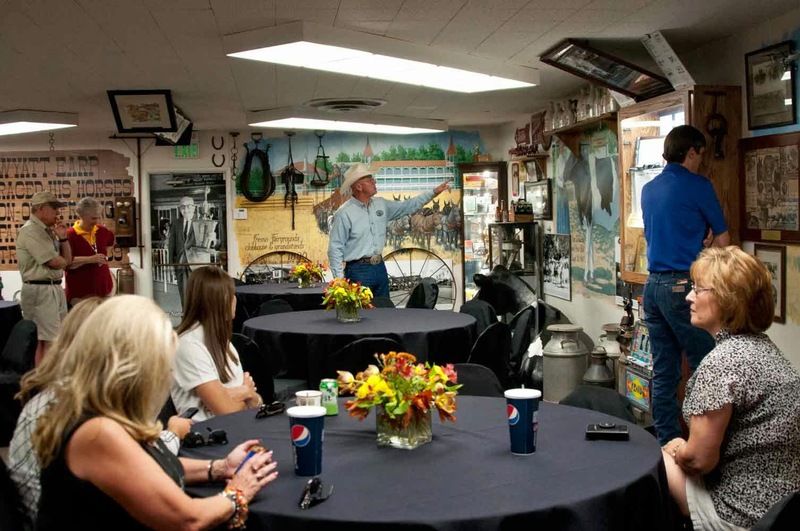 During one of Johns local group presentations, a retired newspaperman offered him all of the original drawings he had done as advertisement in the Fresno Bee for the fair over the years. With no room available, John hung them from the ceiling. Long time Fresno resident and motorsport hero Blackie Gejeian not only donated items from his race days at the fair, but came in and signed the wall painting of his race car. The huge amount of history crammed into this small building is amazing. 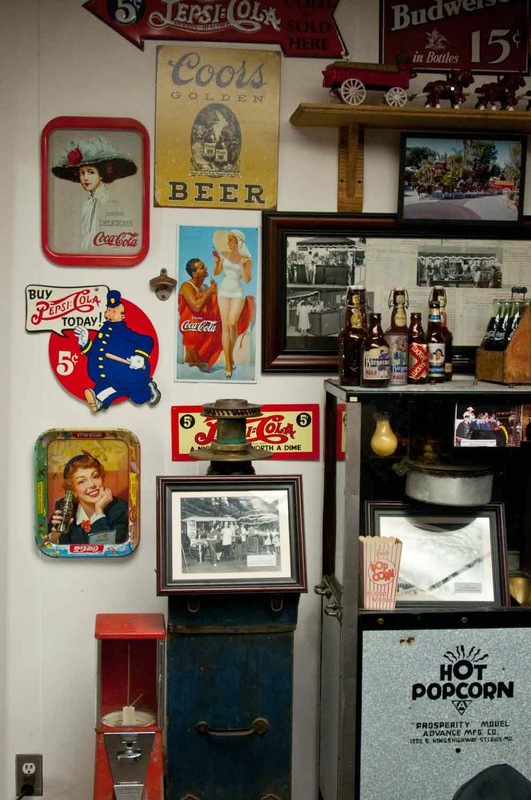 Tours can only be arranged by appointment, but if you've ever been a participant in any fair, or even if you've just been TO a fair ... made arrangements to see this museum. It was worth every second of our two hour tour!!! It was a Scary Day!! My All Time Favorite Holiday!!!! Porky Deliciousness Is Smoking Good!! Back From Hanford ... Chores To Be Done!